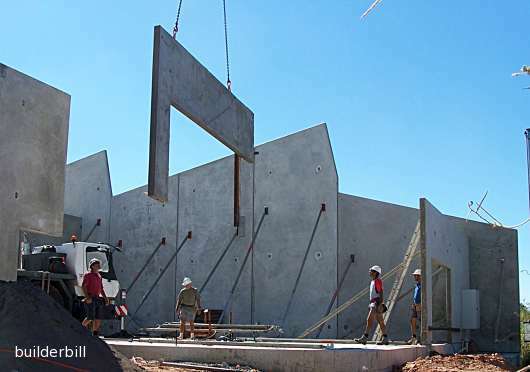 A form of concrete wall construction where flat slabs are made on site and lifted into position when the concrete has become strong enough to lift. Also known as tilt up construction. This type of wall construction saves enormously on formwork. The slabs are poured flat on either a casting bed or one of the buildings floors. The only formwork required is for the edges of each panel and the block outs for windows etc. Specialist manufacturers produce a range of accessories that simplify the construction task. In general the walls are thinner than brick or block walls doing the same job. The main reason that tilt up has gained popularity is the freedom to design into the walls features like curves etc. that would be difficult or expensive by other methods. Also note the total lack of scaffold on this job and compare it to what would be needed for other wall systems.